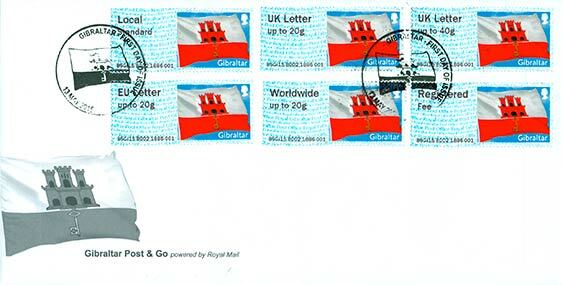 Gibraltar Post and Go Stamp First Day Covers now available - but not from us. 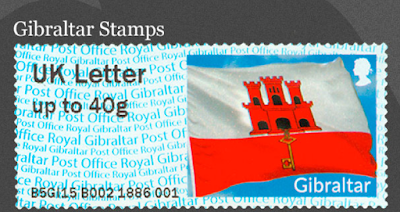 As readers will know, The Royal Gibraltar Post Office (RGPO) joined the Post and Go family when the first machine in its livery was present at London 2015 Europhilex on 13 May 2015. Unfortunately we do not have any information on the Post and Go stamps yet. Hopefully we will have some more info when the machines arrive to Gib hopefully very soon. 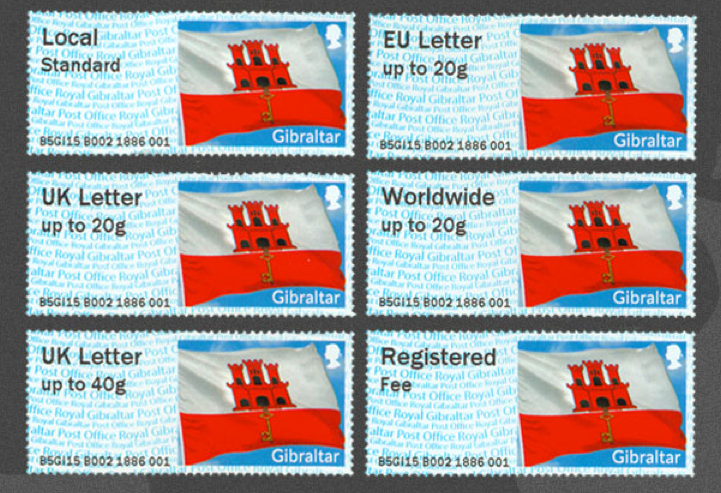 Also the Gibraltar Post and Go will be available at Europhilex 2015 so you will be able to purchase them by the machine. Of course it was the machine in London I was asking about! In the end, as we found, the stamps were dispensed from the machine, but none were available from the Gibraltar Stamps stand. There were no 'back-office' machine stamps, and no official first day covers of course. And on looking at their website, I find that they now have stamps with a GI country code, B002 machine number - and they also have first day covers dated 13 May. But none of these is provided with the customary receipt. The technical information on the website is totally missing, but the FDC is illustrated. 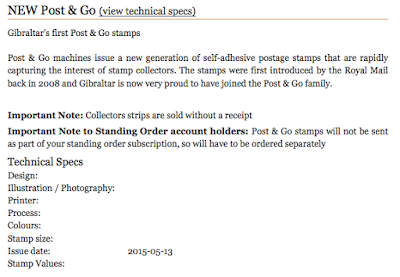 Post and Go machines issue a new generation of self-adhesive postage stamps that are rapidly capturing the interest of stamp collectors. OK, we know that first day covers are rarely produced on the day of issue, being prepared beforehand, or for some time afterwards, and in stock at most bureaux for many months or years. But is this the first instance of a first day cover not being available from either the philatelic bureau or its trade stand at an exhibition on the day of issue, but being contrived two weeks later? I suppose RGPO had to wait for the IAR contractor to get back from London (after Essen) and reprogram B002 (which is located in Bristol) to pretend to be a Gibraltar machine. If the stamps are in Gibraltar, they weren't printed there, and were shipped there in bulk. Yes, many modern stamps are printed in another country - look how many Royal Mail stamps are printed in France. But the essence of Post and Go stamps is that the base stock is printed at the printing works (wherever that may be), and the black value and machine code is printed on site, the country code indicating the country in which they were printed. The datastring on these stamps is totally bogus - unless anyone knows otherwise? This is a message I sent to the RGPO (not Gibraltar Stamps which is a separate company), on 10 May, before the exhibition. No answer was received, so I now make it an open letter to the Royal Gibraltar Post Office which, as far as we know, still doesn't have a public-access machine (if indeed they have any Post and Go machine) in the colony. I am concerned that next week the Royal Gibraltar Post Office will be selling in London stamps which are only valid for postage in Gibraltar but which are not being sold in Gibraltar. I understand that after the London Europhilex event the machine dispensing these stamps will move not to Gibraltar but to Gibraltar House in London, from where the stamps will continue to be available. Somebody in your organisation clearly thinks this is a good idea, and certain to attract collectors, but why would you produce stamps not available in the Colony for sale only in another country. That would be like Royal Mail selling a British stamp only in Gibraltar (or the USA, or Venezuela! ), or the Canadians selling on only in Monaco or Ukraine. Congratulations on this interesting piece. While the widespread use by the mail-sending public of machine-dispensed stamps is logical and sensible and I for one welcome having rapid access in a post office to a kiosk rather than facing a long queue to be served by a human, the philatelic side of "Post And Go" has now become a complete, exploitative nonsense. If a country does not have even one kiosk established in its territory (as I believe is the case with both Gibraltar and Guernsey) then it seems to me to be ridiculous to buy "Post And Go" items with that country's name printed on it. Kiosk BO02 - the machine identified as the source of the labels being sold by Gibraltar Stamps, is situated in Bristol, 1500 miles from Gibraltar, so the likelihood of a Gibraltarian having access to it is pretty unlikely! The labels may be colourful, attractive, even interesting, and useful as souvenirs, but how can they be POSTAGE stamps? Judging by other recent comments in your blog, it looks as though many collectors are already tired with all this nonsense and this current fad may well be about to fade away. I guess the key is are they available in Gibraltar? If not SG would not list (assuming they otherwise think the stamps are available for listing). And why use IAR's back office m/c B002 and not Gibraltar's own m/c GI01? A concrete way to see if these stamps are valid for postage in the colony could be to stick one on an envelope addressed to one's self. Forward it in an envelope to the RGPO with a letter asking them to process it. And wait to receive either a cancelled Post&Go from Gibraltar or a postage due. 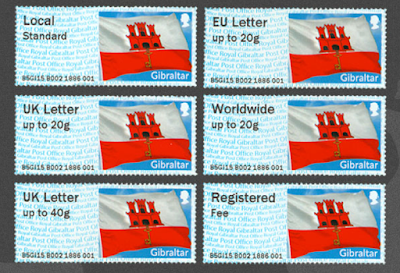 I don't doubt that the Post And Go items are valid for postage in Gibraltar if one buys them in Britain or as a philatelic product sold to collectors in Gibraltar or bought via the Internet or post from Gibraltar Stamps. I merely question their status if there is no kiosk located in Gibraltar for the free use of members of the Gibraltar public. At the very least they have restricted availability under such circumstances which tends to be a reason for not listing them in reputable Catalogues. A French Oversea Collectivity, the French Southern and Antartic Territories, may add to this debate after a fashion. The Collectivity issued a philatelic program, has four real post offices in scientific bases. But almost all the stamps are bought outside the Territories by French people sending themselves letters to obtain local cancellations and special mission stamps/signatures of members of the expeditions (2015 reports by journalists described how the signatures are applied on the ship but the cancellation at post office). Thus, a minor part of the stamps are sold on site to member of the expeditions and not to the general public because the French State allows only a few lucky ones to go on a trip there... Should this restriction - could only be bought from outside the Territory to the general public - implied not cataloguing the FSAT/TAAF stamps? Or only those used by TAAF adventurers? By this example, could - I know I am playing the Devil's Advocate here and am not looking to troll the subject - these RPGO Post&Go from Gibraltar House be seen as a way for British tourists who want to visit Gibraltar on a week-end be able to get stamps in London to be able to send postcards when they are in the Colony when post offices are closed and don't know if shops sell some? Is it the places of sale the problem or the eventual validity in order to be catalogued? Should Stanley Gibbons count number of post offices and their location, or find genuine letter from the place? An interesting question for many countries that many collectors should indeed ask themselves. How many British tourists visit Gibraltar for a weekend and decide they must first go into the centre of London especially to buy stamps to use on their postcards from Gibraltar to back home? If a country produces stamps which are only sold in a foreign country where they are not valid how can they be reasonably described as postage stamps if they must be carried 1500 miles from the point of issue to receive valid usage? Didn't the actual Gibraltar machine at Europhilex have a typo in the Worldwide stamp all day on the 13th? If that was the only "Gibraltar" machine in use (as opposed to an IAR machine), a first day cover without that error is a fraud, and not a genuine Gibraltar cover. There's that, the different machine number and the fictitious GI country code which means "printed in Gibralrar" which they were not. Those factors aside they are perfectly legitimate ways to "capture the interests (and money) of stamp collectors". At least the bureau is only selling one version of the labels with a fixed philatelic code, unlike Jersey & Guernsey who have a fixed code for the 2015 issues use for packs & FDC and a normal variable code for loose strips. Stamps are often printed by printers outside the postal area they are valid for, Enschedé & Cartor, print stamps for Royal Mail, so does that mean we should boycott those. Not forgetting the cattle P&G from pack which carried the NL code instead of GB. I always assumed that the country code related to the country it was sold in and not the country of production, apart from the error with the cattle. You can’t discount the reason for the siting of GI01 in Gibraltar’s diplomatic premises, as a facility for Gibraltarians, resident in London to obtain postage for SAEs sent back from Gibraltar, which would explain the inclusion of the Registered Fee label in the strip of 6. Always assuming they are accepted by RGPO as proof of payment for postage, as yet there evidence of the used on anything other than FDC from Gibraltar. Unlike other stamps sold by the bureau, they are not available CTO. Of course it doesn't matter where a territory's postage stamps are printed but the whole point of Post And Go is that you buy your stamps from a kiosk and it prints them while you wait without having to pay a human to do the physical work of taking your payment from you and handing you your purchase. Having the kiosk situated in another country and not having a single kiosk located in your own country completely negates the raisin d'être of Post And Go. I can not help but think that a reason for locating GI01 in Gibraltar House such as enabling ex-patriots to obtain stamps for SAEs sent back from Gibraltar is wholly specious - presumably not all Gibraltarians in the UK live in London and I don't suppose someone who lives in,say, Manchester is going to travel to London just to buy stamps. Let's be realistic, Gibraltar's Post And Go kiosk currently serves no practical purpose for the dispensing of postage stamps to the mail-sending population of Gibraltar. It is a means of increasing philatelic revenue whether situated in Gibraltar House or in some philatelic exhibition. Good luck to them if they can find stamp collectors who are willing to spend their money on the labels but I shall not be doing so until I know that they meet genuine postal needs in Gibraltar itself. One of the comments refers to B m/cs being at IAR. I understand they are now at Tallents House. This was as a result of level of work for pre-orders for STAMPEX but I am not clear when the move was made. Between Stampex and Perth, judging by the comment on the IAR website for the Perth pre-orders. Does this mean that RM at TH now produce the Bureau version for Jersey/Guernsey/Gibraltar now? Thank you - they made a good page out of WhiteKnight's comments and views, didn't they?